Over at the New Republic, Alexander Hart catches Republicans playing games with charts to try and make Democratic budgets look bigger than they really are. So he redraws the chart, and then Ezra Klein redraws it again. Which is fine, but I think everyone is missing the real dishonesty of the chart: it cleverly has a single bar each for Clinton, Bush, and Obama showing only their “average spending” as a percent of GDP. But that average covers a multitude of sins, so a proper chart is below. Can you tell which of these administrations is not like the other? The Clinton average is about 20% of GDP, but that represents a decline from 22% to 18%. 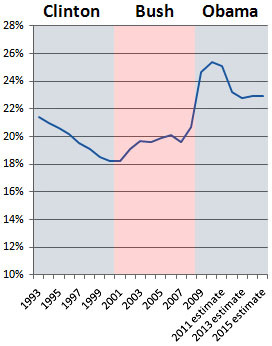 The Bush average is also about 20% of GDP, but that represents an increase from 18% to 22%. And Obama’s average is higher than the other two, but that represents a big slug of stimulus spending in response to the Bush recession followed by — you guessed it — a decline. Even his higher ending number is mostly due to increased interest expense, not to wildly higher primary spending. Anyway, the Republican story is that this time they really really mean it. They really will cut spending, even though they’ve never done it in the past. You can decide for yourself if you believe them this time around.